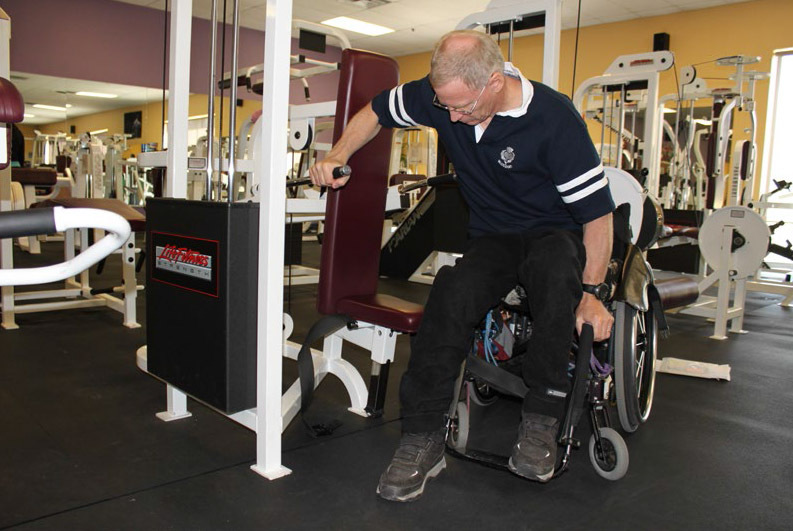 The National Center on Health, Physical Activity and Disability in collaboration with Beneficial Designs Inc. has just released a new guide for wheelchair users who want to safely use fitness equipment. The lack of participation in physical activity is a serious public health concern for all Americans, but even more so for the approximately 56 million Americans with disability who are at a much greater risk for developing serious health problems associated with a sedentary lifestyle. The high incidence of secondary conditions reported among people with disability including obesity, fatigue, pain, deconditioning and depression, combined with environmental barriers that discourage participation in community exercise programs, presents an opportunity for health professionals to target people with disabilities in their long range plans. Physical activity can provide individuals with disability the strength and stamina required to participate in all aspects of life actively and successfully. “Discover Accessible Fitness: A Wheelchair User’s Guide for Using Fitness Equipment” can be used by people with disability and fitness professionals to become familiar with key considerations for wheelchair users using fitness equipment. This guide discusses safety, stability, adaptive equipment, accessibility, exercise precautions, and a full overview of the components of fitness including cardiovascular, strength and flexibility. There are nine chapters in this booklet, which can be downloaded here.